The Genevac Rocket Synergy Evaporator is a powerful tool to accelerate traditionally difficult and time consuming chiral separation protocols. In recent years there has also been considerable interest in the synthesis and separation of enantiomers of organic compounds especially because of their growing importance in the natural products, biotechnology and pharmaceutical industries. In these preparative syntheses the chiral analytes of interest are typically separated in large volumes of solvent. 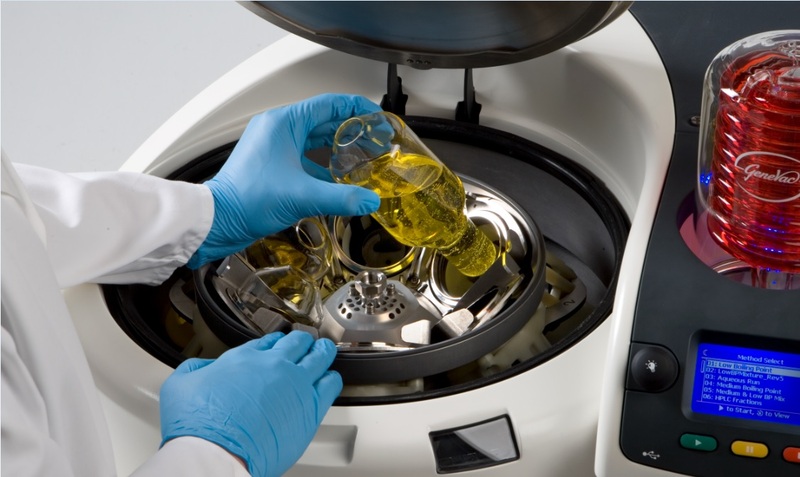 Concentration or drying of these large volumes of solvent using a rotary evaporator is both time consuming and may risk thermal degradation of valuable separated chiral products. Benefiting from a patented low temperature, low pressure steam heating technology – the Rocket Synergy Evaporator is able to achieve the dual goals of very fast evaporation with very precise temperature control thereby accelerating the safe production of chiral separation samples. The unique flexibility of the Rocket Synergy with its interchangeable rotors means a single system can handle the widest range of sample volumes. Fitted with a 6-place rotor the Rocket Synergy is able to dry or concentrate up to six 400ml flasks or 18 x 50ml tubes simultaneously. Replace the flask rotor with a 5 litre stainless steel bowl rotor and batch volumes of up to 5 litres can be evaporated in a single run. Rocket Synergy Evaporators are proven to provide fast, safe and high recoveries of even the most volatile analytes. In addition benefiting from Genevac’s patented Dri-Pure technology, the Rocket Synergy is able to prevent solvent bumping, foaming and cross contamination problems inherent with rotary evaporator and other vacuum evaporation systems.